Here is the link to the page with all the pictures. 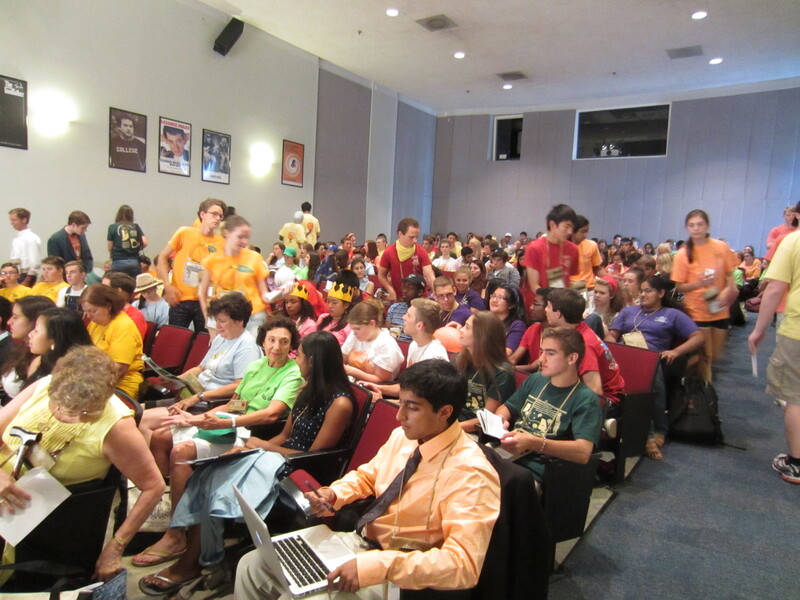 2:00-3:30: Spirit and then GA 2 – mandatory for all. Video of spirit preparations. Video of End of Spirit. 8 am – 11 am: I judged School Scrapbooks. 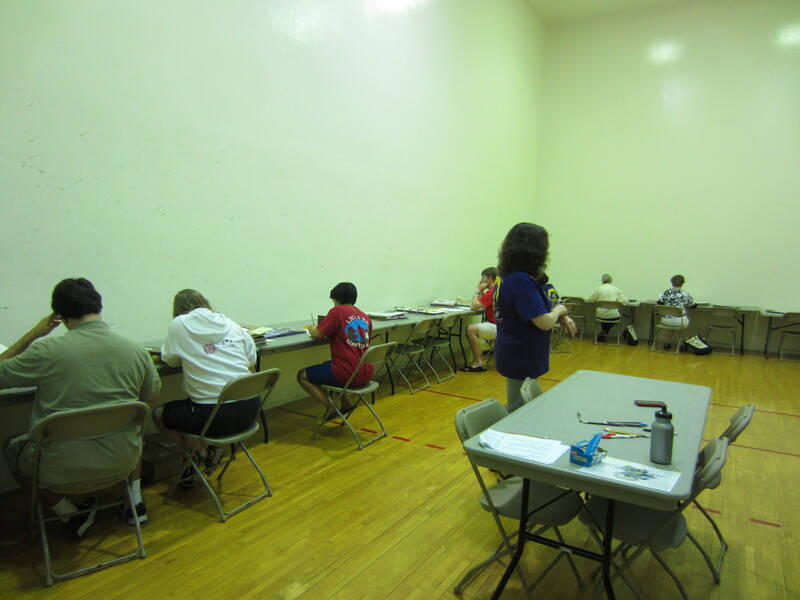 An example of how much space is required for all the projects: they were on tables in the racquetball court. This category takes many judges b/c each book requires such a time commitment. My only task was to judge ‘Content and Theme.’ Most were excellent and used the NJCL theme for the scrapbook, omnium enim rerum principia parva sunt (for the beginnings of all things are small). One was organized by the 9 Muses of Greek Mythology. Another was a Pop-up book organized by month. It took me 2.5 hours (I took a couple of breaks…) to judge only content/theme for 12 scrapbooks b/c you need to put down comments & explanations to justify your score. Only a few teachers were hit during the 10:00 match on the court. 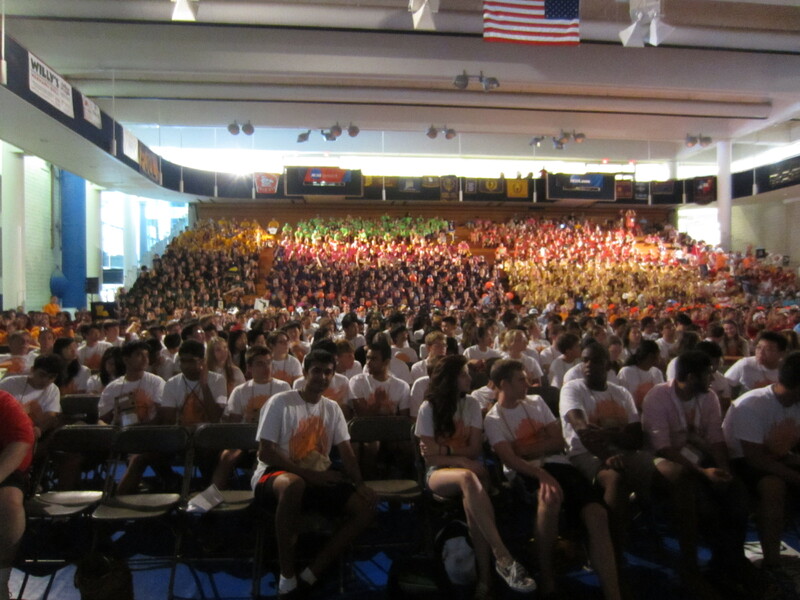 A view of the whole NJCL group from the stage. And, in the steps of Heather Smith (Shaker) and Paul Slater (Summit) and sister Anna Delamerced (Summit), Tino won an NLE Scholarship worth $4,000! The study of Latin really DOES pay! In the words of those enigmatic Racketeers (a regular act at ‘That’s Entertainment!’): It’s true, it’s true! Tino is honored with a NLE Scholarship! 4-5 pm: I was at the NomComm meeting to support Narayan Sundararajan in his run to become the NJCL 2nd VP. I am now in 5th year as the State Chair of Students, and my main task is to mentor the OH officers in their duties. 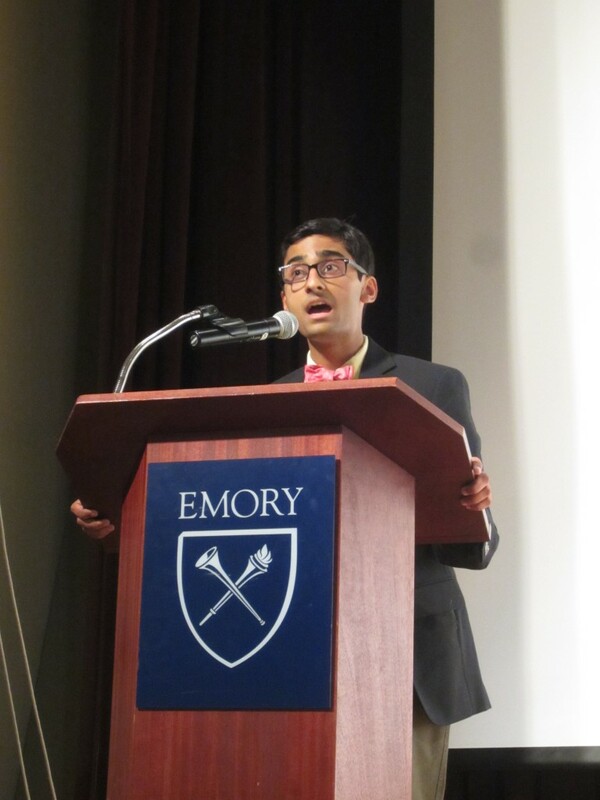 As a freshman, Narayan was appointed one of the representatives from Cleveland, and he was elected as Treasurer as a sophomore. 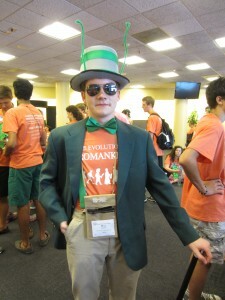 He was a terrific officer, was a font of great ideas, was always willing to help others, was always enthusiastic about the JCL: in other words, the perfect candidate for the NJCL! He gave a great speech and was unanimously approved as the sole candidate for the 2nd VP. Tomorrow during ‘Meet the Candidates,’ Narayan will need to think on his feet and prove that he is worthy (b/c he IS worthy) by answering some tough and also some goofy questions from the voting delegates from other states. More on his election as the week progresses. 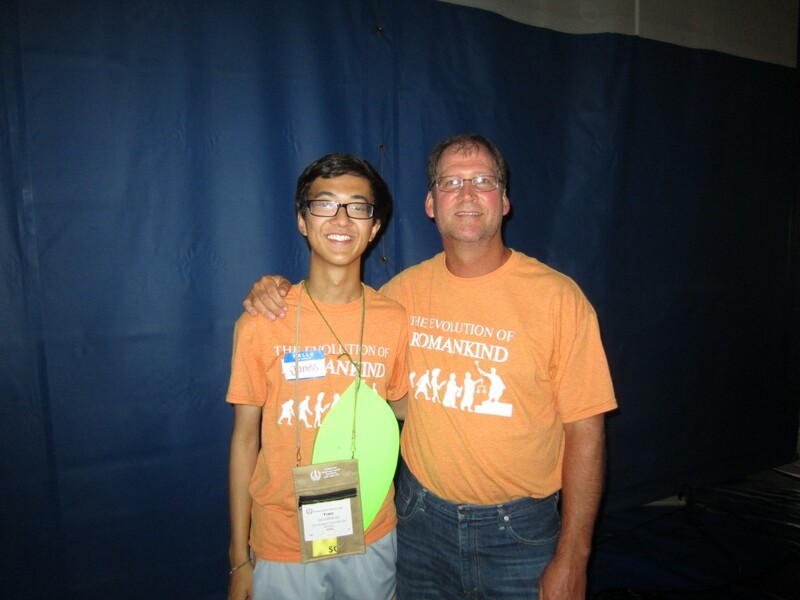 Tullus and Will at NomComm: they are the 2 official voting delegates from OH. A view of the crowd at NomComm. 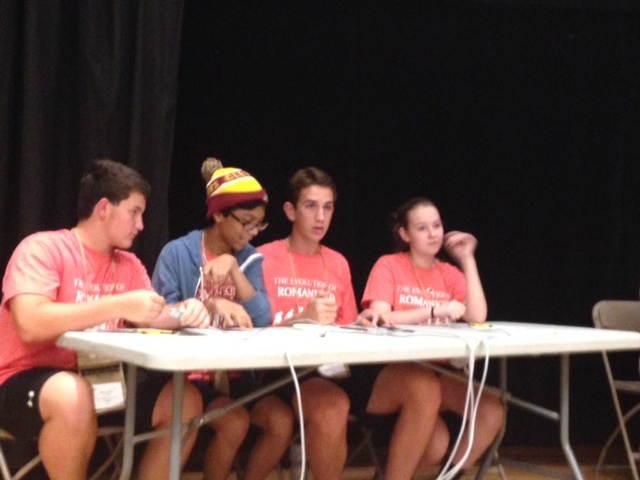 6:15-9 pm: Competitive Certamen began today with the 1st of 3 preliminary rounds. Each round has 20 toss-up questions, with 2 bonus for the team that answers correctly. Toss-ups are 10 pts, and each bonus is 5 pts. There is a total of 400 pts per round, and a score of 100 or more is good, and around 200 is great. Advanced had a solid round. 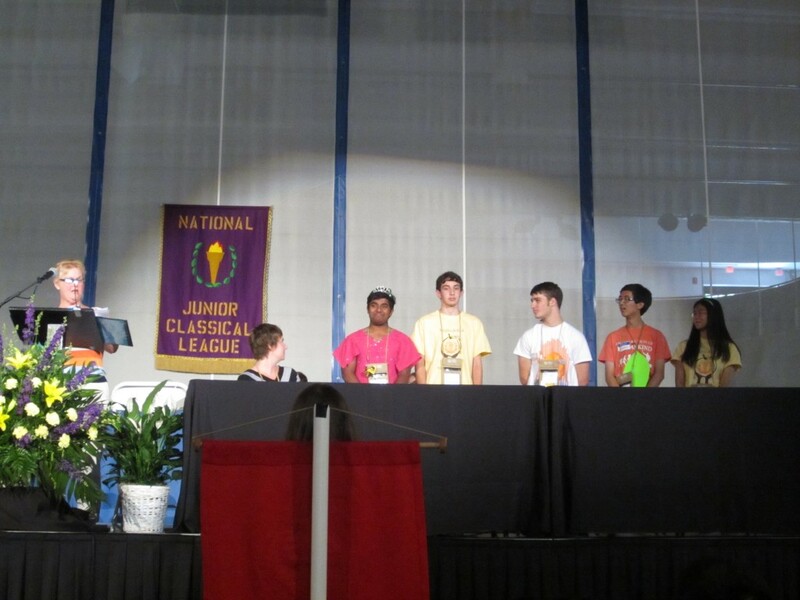 They got the 1st 3 questions, then won only 1 of the next 11, but rallied to take the final 5 questions. Final score: OH 135, IN 85, NC 30. The intermediate team was matched against perennial power Mass. The match started uneven, with only 2 of the 1st 5 questions answered correctly. Then Mass took 4 of the next 5, but OH rolled to victory in the last half behind the quick buzzes of Blake Himes (Shaker). 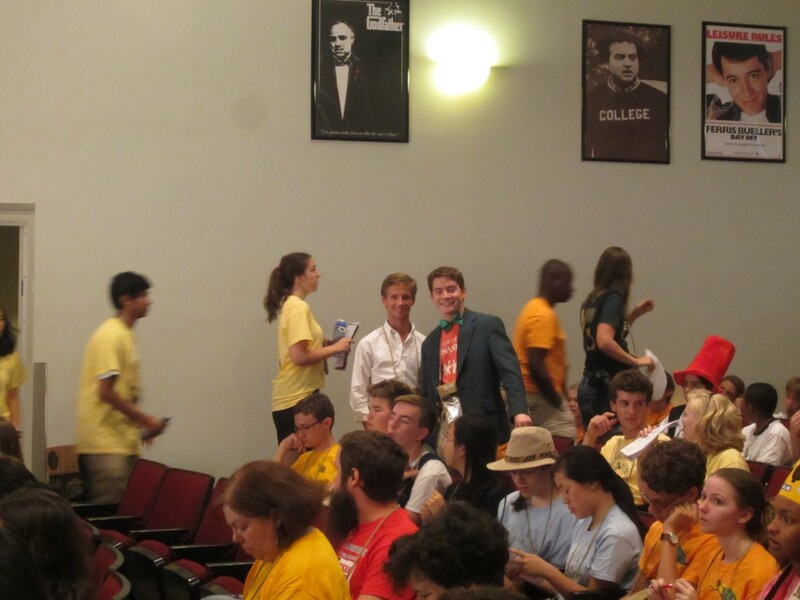 [At the evening fellowship, when certamen came up, the delegation began chanting, ‘Blake! Blake! Blake!’ Pretty cool stuff.] 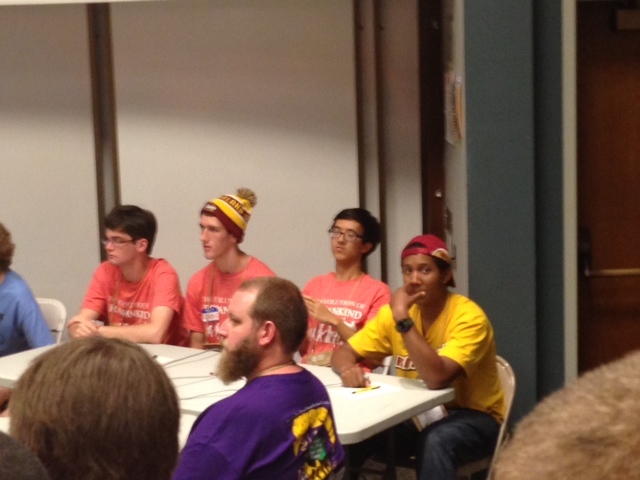 The Novice had a hard 1st round match against Mass (again) and a strong GA team. Caroline Klette (Summit) put some points on the board on question 12. The players were very nervous and were just not quick enough, but they will be ready for the lightning fast pace of play during rounds 2 and 3 tomorrow. OH Advanced: Ben Robertson (Shaker), Will Beatrez (St. Edward), Tino Delamerced (Summit), and Matthew McMillan (Shaker) . Alex Lathem (Westlake) and Adam Sichel (Indian Hill) will play in tomorrow’s rounds. 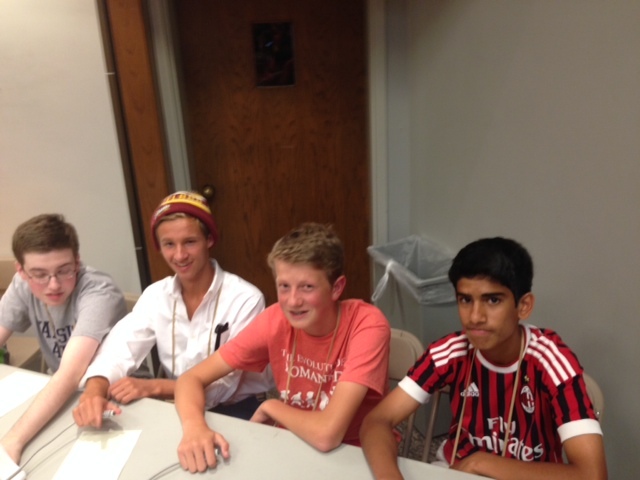 OH Intermediate: Sam Katz (Shaker), Tullus Dean (Summit), Blake Himes (Shaker), and Vishnu Kasturi (Shaker). OH Novice: Michael Warden (Summit), Joseph Delamerced (Summit), Charlie Dwight (Seven Hills), and Caroline Klette (Summit). To thank him for his help and hard work, Treasurer Lindsey Dierig gave Nice Price of Indian Hill a star trophy and a book (L. Ron Hubbard’s ‘Disaster’, the 8th book in his Decalogy).